Halloween may have swept by like a bat out of Hades, but I'm already planning next year's costume. I had such fun at Gemz of Arabia's Haflaween belly dancing event at Circles that I'm hoping to attend another next year. Which means I need to incorporate a hip scarf into my costume so I can shake and shimmy on the dance floor. Thanks to an Amazon gift card I earned by sharing links through Crowdtap, I bought a sensational shining scale paillettes hip scarf in green to embellish a mermaid or dragon costume. Since I already went splashing around Etsy for mermaid costumes, I dried off my wings and took to the skies. 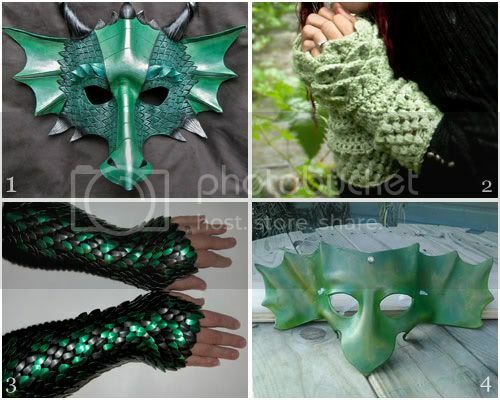 I had to circle around these leather masks and scaly arm accessories to get a better look. Wow, those are pretty amazing! These would have been a great idea for Halloween! Oooh, these are some of your best finds yet! You are the girl to go to for inspiration from faeryland, Kristin! Love it all, Sweetie! Wow those scaled arm pieces are incredible! Great hunting, lady. You find the most interesting items! I'll have to check out each shop now. Thanks for sharing!